Modern English has followed up its Glastonbury campaign for the Foo Fighters with a new app allowing users to curate a bespoke Spotify playlist of the band's music. The Spotify Mixtape Generator, which was officially released through the Foo Fighters social channels on Friday, engaged over 20,000 users in its first weekend. It allows users to curate a Foo Fighters Spotify playlist based on the user's ‘vibe’ and an era from the band's past. The app was designed and developed in Modern English's Manchester office, with the agency working with record label Sony Music in New York and the Foo Fighters team in Los Angeles. Modern English co-founder Bruce Thomas said: "We have built something really cool with this Spotify app, and people won’t find out exactly what that means for a while. They’re just going to have to use the app and wait and see. But trust me, it’s another Modern English global first and we’re very excited by it!" 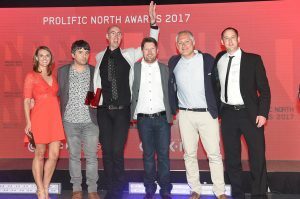 Last week, Modern English's Glastonbury campaign won the Best Digital/Social Campaign at the Prolific North Awards. Thomas added: "The Foo Fighters want to wow their fans not only on stage and with their music releases but also by being innovative with technology. We’re proud they’ve looked at Manchester to achieve this." The agency has previously worked on projects for Stevie Wonder, Peter Gabriel, Madonna, Pink Floyd and Blur.